Register TODAY for Holiday & Winter Programs! Registration links to all our Winter classes/programs are listed below. Tiny Tot Activity Time: Parent-child classes begin January 14th. Ages 18 – 42 month. Tiny Tot Music & Movement: Parent-child classes begin January 15th. Ages 24 – 42 month. Holiday Tiny Tot Classes: This special 3-week mini-session of our parent-child classes begins December 3rd. Ages 18 – 42 month. Discovery Time/STEAM Classes: New sessions begin November 12th, January 14th & March 11th. Ages 4-6 years. Teacher Workday Programs: Full day care for your elementary aged children available on all FCPS Teacher Workdays! Ages 6-10 years. Preschool & Pre-K Classes: Registration is ongoing…Call for availability (703) 689-3104. 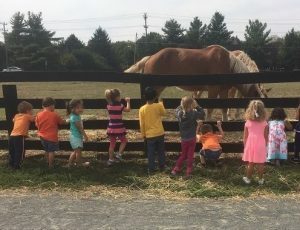 Preschool Mini-Open Houses: Signup today to visit our preschool and learn about our Fall 2019 classes. Registration for Winter Programs opens November 20th. Need Help Registering? Call (703) 222-4664 to register directly! Don’t miss out – Register NOW!